Sign up for FREE! You'll even get 300 points to use toward your first purchase. Or, create your myRewards account when you make your next online transaction. Having problems? Call Us and we'll help get you enrolled in seconds. This means you get 3 myRewards points for every $1 spent! Use your points when you checkout online, or Call Us to redeem just a portion. Points NEVER EXPIRE, so roll 'em over and redeem them later. Redeem your points for almost anything… even gift cards or standard shipping! To return to our site, close this window. *Customer can not combine any two discounts on purchase, such as Price Match or Warehouse Deals. BBQGuys.com reserves the right to change the membership rewards program terms and conditions at any time. 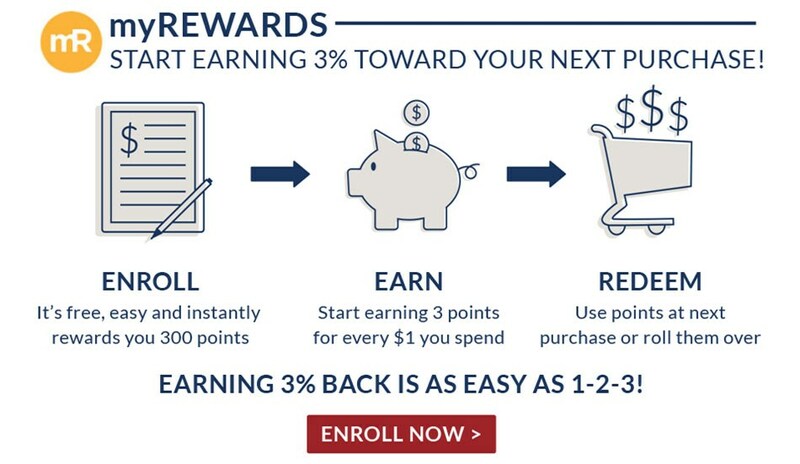 This may include, but is not limited to, the number points earned for spending, the number of points required to redeem rewards, or any caps or fees on earning and redeeming points. BBQGuys.com may cancel the program, as well as any point balances by giving 120 days prior notice by email. If the email is not received due to a spam blocker, a change of email address, a full mailbox or any other reason, BBQGuys.com will not be held responsible and will not be required to extend the notification time. call in to place your order and let the Customer Service Representative know that you have a myRewards account and give them the email address you used to start the account. If you do not have a myRewards account at the time you are placing your order, you may request the Customer Service Representative enroll you if you are placing your order over the phone, or signing up for one before finishing your order if you are using the shopping cart. Failure to make sure your account is assocaiated with your order in one of the manners described above may forfeit the points to your account. sign up for myRewards during the transactional process on the shopping cart. Upon filling out the application members may also be required to answer a secret question so that customer service agents may be able to verify the identity of the customer. In the event that a BBQGuys.com myRewards member's method of payment is declined, points will not be earned. Points are not earned until the transaction is completed and paid in full. Points accrued by BBQGuys.com myRewards members are not transferable by operation of law or otherwise to any person or entity and cannot be transferred to any other account. Credits posted to orders that acquired myRewards points, including those arising from returned goods or services will also post a debit to the points accrued in your myRewards account. BBQGuys.com reserves the right to decline any request to convert myRewards points for purchase at any time.